There are certain features that always seem to look good in photographs: umbrellas, beautiful people, beautiful moody people, beautiful moody people smoking… you could add many things to the list, but one which always catches the eye is a hat, especially on men and if the men are tall and thin and have a wonderful gait, then it is just perfect. But what are the chances? In today’s world, hats are on men are not that common. Look at photographs from the first half of the last century and all the men are wearing hats. So, today when I see a guy with a hat I nearly always try to get a shot of them. This photograph below is another in the series of images shot late at night at the Shibuya Scramble Crossing back in April. The couple pulled up in front of me waiting for the green man to start his flashing to indicate their chance for a safe crossing. How cool, I thought. There he was dressed in a black suit with a wonderfully adventurous black hat and in equally eye-catching fashion, she was dressed in a white blouse, black knee-length shorts and had these little white socks just visible over the top of her black high-heel boots. I crouched down to get a shot of them from a low-down perspective. Never the easiest thing to do with my dodgy knees. I can get down OK, but getting back up I am a little slow and a little creaky. I got an in-focus shot of them from behind (tomorrow I will post this) and then rejigged the settings to blur things up. I shot about 5/6 of these shots as they crossed and when they got to the other side I approached them and showed them the shots and they responded in exuberant surprise. Japanese express surprise like no other nationality I know. There should be a different word for the look of surprise the Japanese can create. The eyes widen, the eyebrows spring up, the jaw drops as the mouth forms an O to let the exclamation of surprise escape. You cannot help but beam in response to this. They are so wonderfully expressive. Reactions like this are magical. We stood for a few moments at the crossing, looking at the shots I had taken. Then the girl got her phone out and gestured to request permission to take my photo. I eagerly nodded in agreement. Then with more gesturing and smiling and nodding I opened up my Flickr on her phone to show her where I would post the photographs I had taken. At the time, I thought it would be a few weeks before I posted the shots, but it has been a few months. I doubt if they have kept my Flickr address, but you never know. If you have, again thanks! 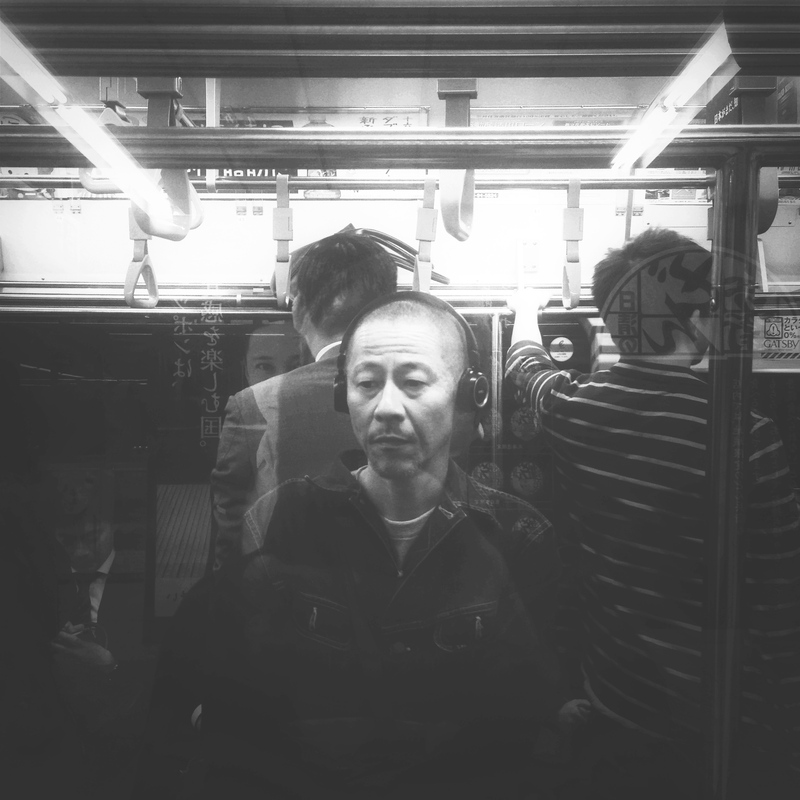 The iPhone shot is a standard catch-a-guy-who-cannot-move type shot, taken through the window of a subway train in Tokyo. Shots like these are easy. The people can’t move and very often they are sullen and melancholic which always creates a nice mood for the photograph. Shooting through the window results in reflections and distortions, which are always nice. I like that the guy with the headphones is not making eye contact, but the guy in the advertisement is staring straight at us. 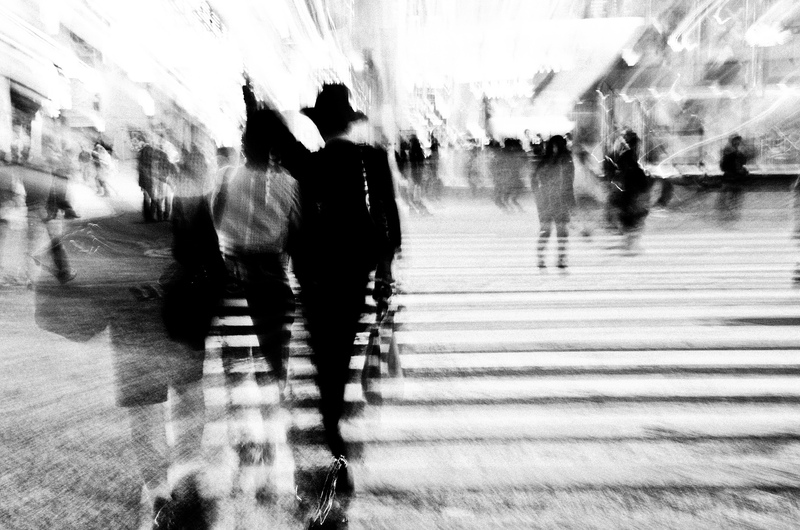 This entry was posted in Daily posts to Flickr, iPhone, photograph posts, Street Photography and tagged art, black and white photography, blur, Brendan Ó Sé, flickr, iPhone, iphoneography, mobile photography, people, photographs and words, photography, Shibuya, Shibuya Forever, street photography, Tokyo, travel.